Pets are good company — there for us to interact with, to teach our kids responsibility, and in some cases to guard the house. But soon they will be usurped by robots — if this year’s Consumer Electronics Show (CES) in Las Vegas is anything to go by. Soothsayer of multitudinous trends and things we didn’t realize we couldn’t live without, the annual CES has become the trade show to showcase all new technology. From intangible software such as “bleisure” apps to help business travelers make more of their precious leisure time, to cars — flying cars, walking cars, even self-riding motorbikes. In fact, CES has become so all-encompassing that the once-unmissable, now-failing Detroit Auto Show is moving from its traditional date in chilly January to the summer in an effort to regain its place as the premier car show. At the more quirky end of the CES spectrum — or perhaps “sinister” would be a better adjective — were the many pet-related offerings on display. The last few years have seen inventions to help us humans look after our pets — by hooking up Fluffy’s bed or food bowl to the internet-of-things to monitor our pets’ health, for example. The offerings this year however seem hellbent on helping owners care less, or even on replacing Fluffy with something plastic and easier to care for. According to some on the sales floor of CES, separation anxiety, obesity, and depression are all big problems for pets. You could opt to quit your job and stay home with Fido or take Chairman Meow with you to the office, but these may not be ideal solutions for all (or any) pet owners. Thankfully there is another way: You can purchase a robotic pet toy to keep Rover company and get him moving around the house during those lonely 9-to-5 hours. The VARRAM pet-fitness robot is cat- or dog-friendly, and comes equipped with infrared sensors so that it won’t bump into the dresser and send Grandma’s heirloom vase crashing to the ground. Unfortunately, the same can’t be said of your Doberman pinscher while it’s chasing after said robot. If pet depression, walkies, and scooping are just too much for you, why not eschew the whole “alive” problem altogether and get a robotic pet? Coming out in the fall is the Lovot. 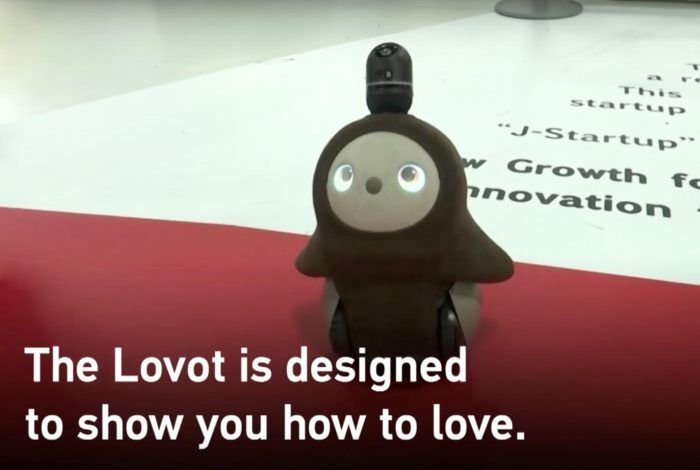 Its name is a portmanteau of “love” and “robot,” and it’s been designed to look cute — if you can ignore the five-inch camera and sensor pole attached to its head, and concentrate on its oversized eyes and button nose. It whizzes around the place, comes when called, and coos when touched and cuddled. Lovot is not intended to be practical, but the camera could easily be used as a monitor to watch your house or even your kid, if you’re the kind of hands-off parent that would prefer to spend $3,100 on a spy toy rather than play with your own child. If the Lovot sounds more mobile than you’re able to cope with, a company called Zoetic AI showcased Kiki, an altogether more static version of a pet cat, which jiggles about when you cradle its face. Watch the videos below to catch a glimpse of the hard, unfurry, walkies-free future pet that owners can look forward to.